Berated all his life by those around him, a Friar (Black) follows his dream and dons a mask to moonlight as a "Luchador" (wrestler). 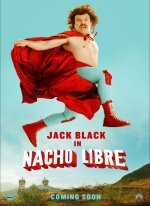 Nacho Libre release date was Friday, June 16, 2006. In this true life inspired story, Jack Black will play a Mexican priest who moonlights as a masked Lucha Libre wrestler in order to save an orphanage destined for closure. All the while, the priest must keep his identity hidden from the wrestling community and the church.